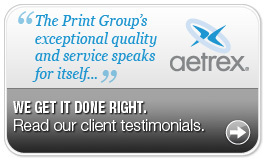 I have been working with The Print Group on a weekly basis for almost 20 years. They have always helped with ideas and solutions as well as providing a cost effective, quality product, in a timely manner. Thank you all for your hard work! Whenever I am in a bind I know I can always count on The Print Group to come through for me. They consistently deliver results! Since we started using The Print Group for our corporate stationery needs, we have been extremely satisfied. They set up an online site for us to place orders which require no proofing. It is a seamless process which works great. I can always count on them to deliver as promised. 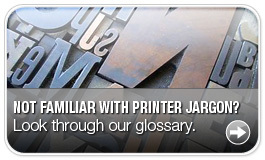 We started our business relationship with The Print Group several years ago. It has developed into a real working partnership. 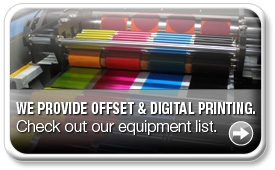 They have provided us with both print material as well as a web based ordering systems. I know I can look to them for suggestions on efficient and cost effective ways to produce our marketing materials." Many thanks to your team at the Print Group! Our brochure was the best it has ever been and everyone told me how wonderful it looked. I was so thrilled! I appreciate your help getting me through it all. You did an amazing job. They're the best! I make a call and it's taken care of. They provide me with everything from labels to promotional items!"